In the Twin Cities, we’re getting all psyched about hosting the Superbowl this year, in our nifty new (ish) Stadium. It’s a big deal. There’s a new layout in our Meet Minneapolis guide. Every day there’s a new article and new happenings. But what are we Minnesotans going to eat? (Unless you’re at the BIG party and Andrew Zimmern is cooking or you’re a diehard foodie.) We’ll be eating something do-able. We’ll have wings and lots of them, dips and chips galore. Some kind of Meatballs. Maybe Chili. Pizza. Tacos. Wild Rice Soup. And bars. Lots of bars (they’re really a Minnesota thing) for dessert. And maybe these Sliders. Philly Cheesesteak Sliders. Sliders are kind of ubiquitous for game day. They’re fun, you can pick them up, they’re easy and you can make a bunch. Heck, make trays ahead and just pop them in the oven for 15 minutes as needed. And people love them. Get one of these little sliders in your hand, the cheese melding the peppers, steak, and buns together & you’ll go nuts. Honestly, I think the magic is in Hawaiian Rolls. They’re super soft, sweet & salty. Hawaiian Rolls can be pricey but are usually on sale around the Superbowl & you can sign up on King’s Hawaiian site for coupons. As far as what’s inside a Philly Cheesesteak Slider? There’s a lot of options, but with a dish like this that anyone can make, you’ll want yours to stand out, right? But you still want them to be cheesesteaks. And you’re gonna want to hear that these are the BEST Philly Cheesesteak Sliders anyone has ever made or had. Preheat oven to 350°F. Spray an 11 x 7″ casserole lightly with cooking spray. In a large skillet, add the oil, heat to medium high and add bell peppers and onions, and cook until almost soft. Add salt and pepper, then push them to the side. Be generous with the salt. Salt and pepper the steak, generously. Add the steak in two batches to the skillet, pushing and cutting at it with a spatula until it’s broken down and just cooked through. Toss the first batch up on top of the veggies and add the second batch to the skillet. Set aside, off heat, when finished. If desired (and recommended) add a few dashes of Worcestershire sauce to the steak as it cooks. Remove rolls from packaging, but don’t separate into individual rolls. Using a long, serrated knife, slice through them all at once, horizontally, about halfway through. Remove the top layer. Spread the bottom layer with mayonnaise, then add the rolls to the casserole dish. Mix together the pepper, onion and steak mixture and distribute over the mayonnaise, as evenly as possible. Top with cheese. Add the top layer of the rolls. In a microwave-safe cup, melt the butter (about 1 minute) then add garlic powder and a couple of dashes of Worcestershire. Brush the mixture over the rolls. Sprinkle with sea salt.Cover with foil and bake for 10 minutes. Uncover and bake another 5 to 10 minutes, until the tops appear a little dryer and the cheese inside is melted. Serve immediately, out of the dish or place on a platter and separate, if desired. Note: Freeze the beef for 20 minutes to make it easier to thinly slice. If you use deli meat, just heat it through, briefly. Make these with layers of ham topped with cheese, or turn them into any type of slider you’d like. Use Cheez-Whiz instead of Provolone. Vary the butter topping. Go heavier on the Worcestershire or try using a finely chopped shallot or onion or fresh garlic in the butter. Just toss the butter in a pan instead of melting in the microwave and then add the aromatic. Leave out the mayo – keeping in mind the mayo provides a protective layer so the meat doesn’t overly soften the bread and it all holds together. Use a coupon matching site! Every store has a group of enthusiastic Coupon Matchers. Do not discount the savings! Follow my 12 Strategies – You’ll see them on the upper drop-down menu of every page. Don’t get discouraged. Keep shopping at the best prices and your fridge/freezer and pantry will be stocked with sales priced ingredients. Shop well for the cheese and buy on special and use coupons on the cheese and rolls. Steak on special will generally be less than either the Deli meat or the Frozen Cheesesteak meat. I’ll be taking this recipe to Fiesta Friday #207, hosted this week by Lily @ Little Sweet Baker and Judi @ cookingwithauntjuju.com. This entry was posted in Click here for Bargain Meals, Click here for Fabulous Food Posts and tagged Appetizer, Beef, Bell Peppers, Bread, Cheese, hawaiian bread, Mayonnaise, Philly Cheesesteak, provolone, Sandwiches, Steak. Bookmark the permalink. Hi Chef – they really are! OK, I guess I don’t follow football closely enough, because I didn’t realize you all are hosting the Super Bowl!! That does sound exciting!! And these sliders looks Super Bowl worthy! I’m making them if you can get ourselves invited to a Super Bowl party! thanks Mollie! I’m not a big football fan, but we were so excited because we thought the Vikings were going to win last week & be in the Superbowl. But we lost. By a LOT!! 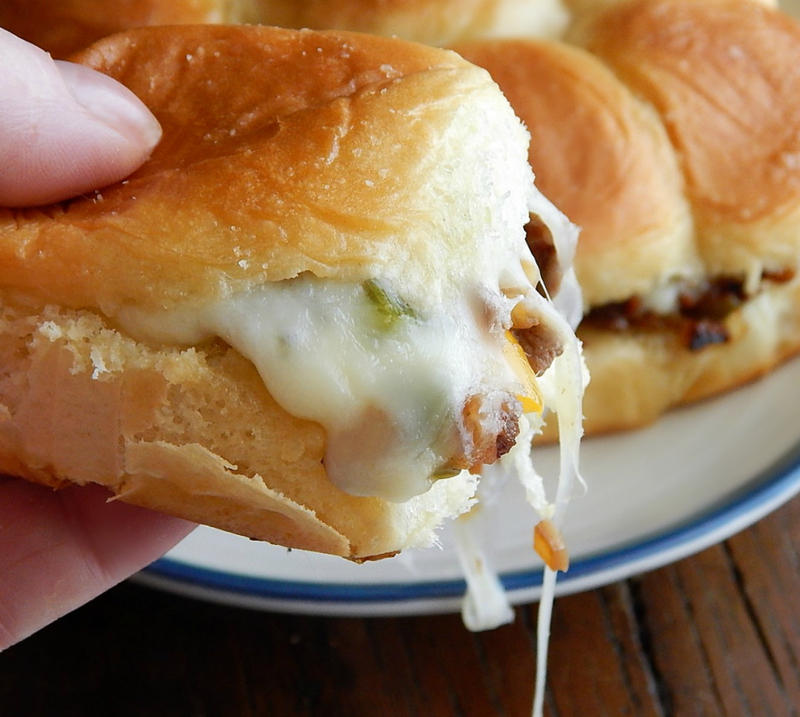 I love philly cheesesteak sandwiches and these would perfect for a party. Hey, isn’t Super Bowl coming up? Next week – but it’s bittersweet for us in the Twin Cities. Our team, the Vikings were contenders but lost on Saturday so they’re out! lol, Angie!! Yes, make them! Make more than you think you’ll need! Happy FF!! I had this sandwich when I was in Philadelphia last summer – one was outstanding and the other – not so great. Your sandwich looks good and I do like a smaller sandwich – then I can have two. Happy Fiesta Friday! Why are you doing this to me, Mollie? I’ve never learned my lesson: not to visit your blog when I am hungry!! Now, I want these! Aha! You just gave me an idea what to feed to my friends when they come for brunch. 😀 Thanks, Mollie! Have a lovely week! Thanks Jhuls, and you, too!! Love Philly cheese steak! These sliders look amazing! Thanks! They’re so easy and really hit the spot! I’m hungry now, and I’m not really a sandwich person!!! Thanks! I think this is kind of an oldie but goodie recipe! They’re just as fun filled with ham and Swiss or ham and Cheddar, too. You have NO idea how badly I wish I could eat these. I LOVE LOVE LOVE Hawaiian Rolls. I’ve even written to them asking them to PLEASE do a gluten free version. I love the story behind the history of the company if nothing else which I discovered when trying to find the place to write about a gluten free version. They began in a small mom and pop grocery and of course tourists would have them. It didn’t take long before tourists were writing to them having them ship to homes all over the country. Over time it built to such a business its what we know now. I love hearing about ordinary people creating something that becomes a major business for them. That IS the American dream. Anyway, these look SO good. MAYBE I can find some sort of gluten free roll to use for them although I’m not holding my breath on that. Finding gluten free bread which is even edible is hard enough let alone something even close to how good these are. I have one question with these. Ree Drummond (Pioneer Woman) does some sort of sandwich apparently her mother used to make in bulk and freeze then could be heated and served at a moment’s notice. Could these work this way? Could these be made in bulk, flash frozen individually then stored in plastic in the freezer to be reheated in the oven at a later time? I wasn’t aware of the story, so I’m glad you told me! I can’t imagine how difficult it would be to have to avoid gluten! I always suspected gluten free probably wasn’t as good. My heart goes out to you. I don’t think there’d be any issue with the freezing and thawing. I’m more familiar with reheating things in the microwave (coz my 86 & 90 year old parents were addicted to Jimmy Dean sandwiches!) I learned that you wrap in a paper towel or napkin, put on deforst for one minute, then turn over and heat for about 30 seconds for those, so that would give you a good ballpark idea on these. I’m curious – have you thought about baking or tried baking anything gluten free? Had me on them melty cheese! It’s all about the cheese, isn’t it?! These will definitely go down well! Isn’t that the best part! ?